With lightning reflexes and a lot of luck, some people can catch squirrels with their bare hands—but don’t. The most important thing to know about how to catch a squirrel is that a squirrel that is easy to catch is usually a squirrel that is carrying an infectious disease, and some of the infections that kill squirrels can make people very sick. A variety of squirrel traps, cages, baffles and even a squirrel pest repellent, however, make catching squirrels humane and safe. Some methods are much easier than others. According to the National Geographic, there are over 200 different types of squirrels. A snare pole, also known as a catchpole, is a long stick with a cabled loop on one end. Most trappers hold the snare pole with one hand and hold a broom or brush for “herding” the squirrel with the other. The noose is wide enough to slip past the animal’s neck and hold the animal by its midsection. The best way to make sure an animal does not suffocate is to snare it by its neck and one front leg. In most states of the United States, licensed pest control operators have access to ketamine, tiletamine, metatomadine, or alphachloralose to sedate animals once they are captured, but individual homeowners are highly unlikely to be allowed to buy these drugs. The noose of the snare pole tightens when the cable pulls tight. The snare pole also has a release feature that can deposit the live animal into a cage for transport to the wild. It is always a good idea to wear gloves so it is not necessary to touch the animal, and it is essential to have a cage ready to deposit the captured squirrels. Don’t try to hold squirrels in buckets with a lid. They will escape when you add their fellows. It is also possible to capture squirrels with a hoop net. A hoop net is attached to a circular metal piece, o hoop, which can be placed against a moveable flat surface to keep the captured squirrel inside. The flat surface is placed over the door to a cage to transfer the squirrel from the net to the cage for transport to the wild. A one-way door, also known as a squirrel baffle or check valve, allows squirrels to go out of an enclosed indoor space but does not allow them to come back in. Be sure to check for the presence of baby squirrels that may still be dependent on their mother before attaching a one-way door or baffle funnel leading outdoors. Rat traps are too small to catch squirrels. Many homeowners who are frustrated by damage caused by squirrels will attempt to catch squirrels with body grip traps. Body grip or body gripping traps are spring-activated traps that come in various sizes. These traps are sometimes called “Conibear” traps, after a popular model made by the Oneida-Victor company. A body grip trap looks something like a giant rat trap turned on its side. There are body grip traps specifically designed for trapping squirrels. Body grip traps are not designed for trap and release. If the right size trap is put out, any squirrel that touches any part of the trap will be instantly suffocated or decapitated. The process of setting a body grip trap, however, can also be painful for humans who do not know how to use it. Setting a body grip trap requires pulling the sides of the trap together until they almost touch, and then latching them together with a piece of metal known as a “dog.” There are body grip traps that have a safety feature that allows the user to pull up just one side of the trap at a time, but it is necessary to release the safety before the trap is operable. When an animal passes through any part of the trap, the latch pops open and the trap snaps shut. If the trap is set so it lies flat on the floor or ground, it will capture the squirrel by a leg or by the middle of its body. If the trap is set so it is perpendicular to the floor, it will snap shut on the squirrel’s head or neck, killing it quickly. Where should you place a snap trap for squirrels? The best way to use a body grip trap is to place it at a hole squirrels are using to enter and exit the attic or storage room. Whenever a squirrel comes in or goes out, it will have to pass through the trap. Hardware cloth can be used to make the hole smaller so that squirrels are sure to have to pass through the trap. It’s important to be careful with the placement of snap traps. Body grip traps can also kill kittens and puppies. Choose a bait that appeals to squirrels but that does not appeal to pets, such as marshmallows or chocolate candy. To make sure humans don’t get caught in the trap, cover it with a cubby hole cut out of a box with two open ends. This can also make it easier to dispose of the squirrel. You can also buy a one-way trap that only captures animals coming in to a space, and that won’t capture an indoor pet that has only come by the trap to investigate. It is also possible to set the trap so that a mother and young returning to the wild can be allowed out but no new animals will be allowed in. A foothold trap is essentially a body grip trap modified to capture only the foot or paw of the target animal. The animal suffers permanent injury but is usually not killed by the trap. Foothold traps can be adjusted so that they exclude animals below a certain weight. A foothold trap that can capture a squirrel, however, can also trap most household pets and small children. Most do-it-yourselfers and most pest control companies will trap squirrels with single-animal live cage traps. The trap has only one door, and traps only one animal at a time. After a squirrel enters the trap, usually lured by food, the door behind it closes and confines it inside. Then the whole trap can be taken to the site the live squirrel is to be relocated. The problem with using a single-animal live cage trap to capture squirrels is that only one animal (or occasionally two) is captured at a time, and squirrels typically live in communities of up to 50 individuals. Multiple-animal live cage traps made by Ketch-All® and Kwick Katch® use a wheel mechanism to transfer captured animals to a holding container, but multiple-catch mechanisms can injure kill animals larger than mice. To capture more than one squirrel at a time, a two-door trap is best. And with just one door, the trap only captures animals moving in one direction, usually either going into a space or coming out of it, but not both. The obvious advantage of a two-door trap is the ability of humane capture of animals going either in or out of an enclosed space. Many models of traps, such as the Havahart 1030 Live Animal Two-Door Rabbit, Squirrel, Skunk, and Mink Cage Trap, also can be adjusted to capture larger or smaller animals, so that homeowners are sure of catching squirrels rather than family pets. The Havahart 1030 is the perfect size for catching squirrels. Smaller two-door traps won’t work. The squirrel’s tail can keep the door open. The trap works better if it is placed to block an opening to the outside. This way the bait attracts both indoor squirrels and would-be indoor squirrels. And if a squirrel escapes, there is a 50-50 chance it will escape to the outdoors. It is possible to modify the trap with a “tape trap.” Just place a strip of duct tape in the base of the trap. Unlike a glue trap that always results in a rat’s death, a strip of duct tape will just slow the squirrel down long enough to be trapped behind the door. The tape will likely fall off long before the squirrel is released. Squirrels will devour an apple or an orange hung from the top of the trap. Squirrels that don’t have ready access to a water supply will be hungry for the fruit. When there is a defect with the trap, the Havahart company responds quickly. There is just one precautionary note we must offer for the Havahart 1030. It’s that squirrels can be foxy around traps. In some instances, squirrels learn that one squirrel can hold the trap door open while the other eats the bait. If that happens, remove the trap for a few days and trap the squirrels that have a shorter attention span. 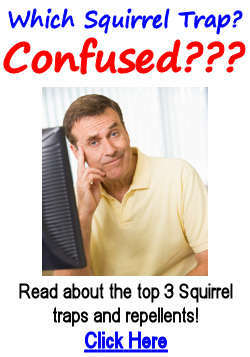 Click the link if you want to learn more about how to get rid of squirrels or click here to learn How to Bait a Squirrel Trap in 8 simple steps.